Toyohara Kunichika (1835-1900) The One Hundred Roles of Ichikawa Danjuro IX: The Pirate Chief Kezori Kyuemon, 1894. Oban. One of Kunichika's swan song series, The One Hundred Roles of Ichikawa Danjuro is a magnificent achievement, summarising both the triumph of kabuki and its demise. The collaboration between the greatest theatre artist and the theatre's greatest star was legendary, and this fine series is its testament. Kunichika worked to commemorate one hundred of the roles of kabuki theatre that Danjuro had mastered. This was a vast creative achievement for the now elderly and alcoholic artist and yet the prints shine and sparkle (literally) with verve and excitement. The cartouches are richly embossed with a cheesecloth pattern and different areas are burnished or else sprinkled with mica. The cartouche in the upper left contains the peony flowers of the Danjuro clan. This was a wildly popular series and surely helped to extend the popularity of the struggling culture of kabuki and indeed of ukiyo-e itself. 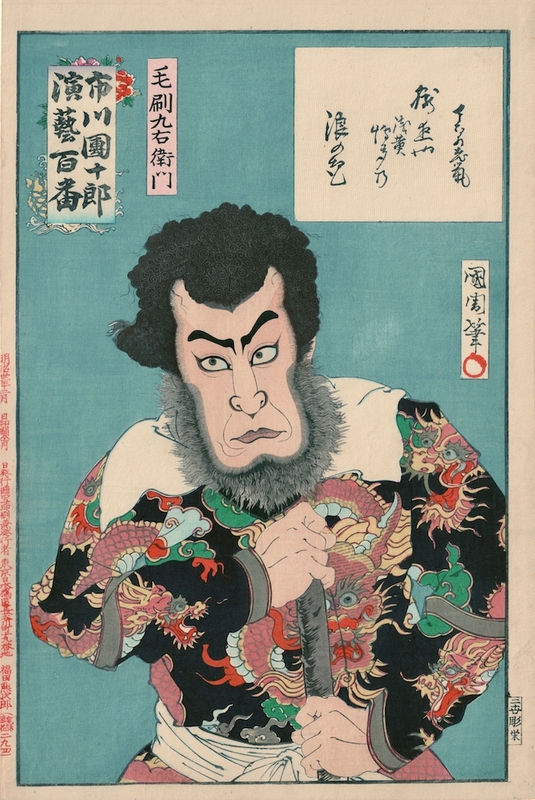 This print shows the pirate chief Kezori Kyuemon from the play, Hakata Kojorô Nami Makura. The role became synonymous with Danjuro, who made the grand styling of the final pose of Act 1 his own. This typical bravura is what Kunichika captures here in this terrific, unique portrait… a great masterpiece in fact of kabuki portraiture. The play is derived from a true story and concerns the travails of the merchant Soshichi, travelling by boat to Kyoto. He is aboard the (unbeknownst to him) pirate boat commanded by Danjuro's Kezori. It is this extended first act which gives the play its drama. The stage is a great cloth ocean and the boat pivots against it, turning to and from the audience. The special effects and Danjuro's outrageous performance are the attraction. Well, Soshichi witnesses the smuggling, is thrown overboard, but makes it to his date with his prostitute lover in Kyoto and becomes one of Kezori's gang, his girlfriend pledging him her love. The cartouche on the right hand of the print reads: the colour of the waves at Hakata is light blue. But this print is really a character study and a fine one at that. The part of Kezori in the play has western attributes - red hair for example - and Kunichika imbues the portrait with a western touch, especially in the pose of the actor which is untypical for kabuki portraits. At any rate it is a very fine print indeed and perhaps the best in the series. Colour, impression and condition are all very fine, the background is an extraordinary, rich carpet of mica redolent of Sharaku's exquisite eighteenth century okubi-e. The print has Japanese album paper backing as is usual.